To evoke the public persona of Whistler in his portrait, Chase adopts the technique of his protégé in his use of a limited palette, soft background, and thinly applied application of paint. Chase’s portrait captured his sitter’s trademark features: the white lock of hair, bushy eyebrows, carefully waxed mustache, monocle over one eye, and wand. 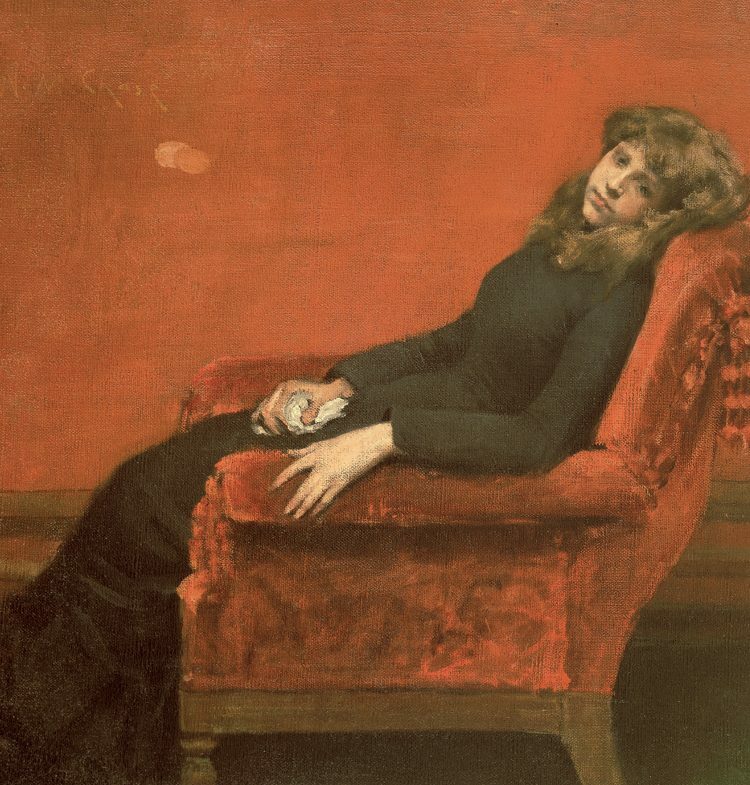 Writing to his wife, Chase reported that his portrait “promises to be the best thing I’ve done.” Whistler, on the other hand, dismissed it as a “monstrous lampoon.” We can only guess what Whistler’s portrait of Chase may have looked like; its whereabouts remain unknown and some suggest that Whistler may have destroyed it. The Young Orphan is one of William Merritt Chase’s boldest early compositions, exemplifying his experimentation with an abstract, expressive language of color and form. Chase likely found his model for the picture from the Protestant Half Orphan Asylum, located next door to his Tenth Street studio at 61 West 10th Street. Thinly painted in gradations of red and black on a coarsely woven canvas, the painting recalls the atmospheric, subtle color harmonies in the work of the well-known American artist James Abbott McNeill Whistler, whom Chase greatly admired. Whistler’s Arrangement in Gray and Black No. 1 (Portrait of the Artist’s Mother) had been a sensation in New York’s 1882 Society of American Artists exhibition and in the Paris Salon of 1883. The year after he completed this picture, Chase spent the summer with Whistler in London, where he produced the portrait of Whistler.